John Calvin The Huguenots were French Protestants who were members of the Reformed Church which was established in 1550 by John Calvin. Huguenot predecessors included the pro-reform and Gallican Roman Catholics, like Jacques Lefevre. Later, Huguenots followed the Lutheran movement, and finally, Calvinism. They shared John Calvin's fierce reformation beliefs which decried the priesthood, sacramental theology, and doctrines of the Roman Catholic Church. They believed in salvation as an act of God as much as in creation as an act of God, and thus that only God's predestined mercy toward the elect made them fit for salvation. Some see this dual emphasis on creation and on salvation, and God's sovereignty over both, as a cornerstone principle for Huguenot developments in architecture and textiles and other merchandise. The origin of the name Huguenot is uncertain, but dates from approximately 1550 when it was used in court cases against "heretics" (dissenters from the Roman Catholic Church). There is a theory that it is derived from the personal name of Besançon Hugues, the leader of the "Confederate Party" in Geneva, in combination with a Frankish corruption of the German word for conspirator or confederate: eidgenosse. Thus, Hugues plus eidgenot becomes Huguenot, with the intention of associating the Protestant cause with some very unpopular politics. "Huguenot" is "a combination of a Flemish and a German word. In the Flemish corner of France, Bible students who gathered in each other's houses to study secretly were called Huisgenooten, or "house fellows," while on the Swiss and German borders they were termed Eidgenossen, or "oath fellows," that is, persons bound to each other by an oath. Gallicized into "Huguenot," often used deprecatingly, the word became, during two and a half centuries of terror and triumph, a badge of enduring honor and courage." As nickname and even abusive name it's use was banned in the regulations of the Edict of Nantes which Henry IV (Henry of Navarre, who himself earlier was a Huguenot) issued in 1598. The French Protestants themselves preferred to refer to themselves as "réformees" (reformers) rather than "Huguenots". Above all, Huguenots became known for their fiery criticisms of worship as performed in the Roman Catholic Church, in particular the focus on ritual and what seemed an obsession with death and the dead. They believed the ritual, images, saints, pilgrimages, prayers, and hierarchy of the Catholic Church did not help anyone toward redemption. They saw Christian faith as something to be expressed in a strict and godly life, in obedience to Biblical laws, out of gratitude for God's mercy. Like other Protestants of the time, they felt that the Roman church needed radical cleansing of its impurities, and that the Pope represented a worldly kingdom, which sat in mocking tyranny over the things of God, and was ultimately doomed. Rhetoric like this became more fierce as events unfolded, and stirred up the hostility of the Catholic establishment. Violently opposed to the Catholic Church, the Huguenots attacked images, monasticism, and church buildings. Most of the cities in which the Huguenots gained a hold saw iconoclast attacks, in which altars and images in churches, and sometimes the buildings themselves were torn down. Bourges, Montauban and Orleans suffered particularly. Huguenots faced periodic persecution from the outset of the Reformation; but Francis I (reigned 1515–1547) initially protected them from Parlementary measures designed for their extermination. The Affair of the Placards of 1534 changed the king's posture toward the Huguenots: he stepped away from restraining persecution of the movement. Huguenot numbers grew rapidly between 1555 and 1562, chiefly amongst the nobles and city-dwellers. During this time, their opponents first dubbed the Protestants Huguenots; but they called themselves reformés, or "Reformed." They organized their first national synod in 1558, in Paris. By 1562, they had a total membership estimated at least a million, especially numerous in the southern and central parts of the country. The Huguenots in France likely peaked in number at approximately two million, compared to approximately sixteen million Catholics during the same period. In reaction to the growing Huguenot influence, and the aforementioned instances of Protestant zeal, Catholic violence against them grew, at the same time that concessions and edicts of toleration became more liberal. In 1561, the Edict of Orléans, for example, declared an end to the persecution; and the Edict of Saint-Germain recognized them for the first time (January 17, 1562); but these measures disguised the growing strain of relations between Protestant and Catholic. Tensions led to eight civil wars, interrupted by periods of relative calm, between 1562 and 1598. With each break in peace, the Huguenots' trust in the Catholic throne diminished, and the violence became more severe, and Protestant demands became more grand, until a lasting cessation of open hostility finally occurred in 1598. The wars gradually took on a dynastic character, developing into an extended feud between the Houses of Bourbon and Guise, both of which — in addition to holding rival religious views — staked a claim to the French throne. The crown, occupied by the House of Valois, generally supported the Catholic side, but on occasion switched over to the Protestant cause when politically expedient. The French Wars of Religion began with a massacre at Wassy on March 1, 1562, in which at least 30 (some sympathetic sources say 1000 or more) Huguenots were killed, and about 200 were wounded. The Huguenots transformed themselves into a definitive political movement thereafter. Protestant preachers rallied a considerable army and a formidable cavalry, which came under the leadership of Admiral Gaspard de Coligny. Henry of Navarre and the House of Bourbon allied themselves to the Huguenots, adding wealth and holdings to the Protestant strength, which at its height grew to sixty fortified cities, and posed a serious threat to the Catholic crown and Paris over the next three decades. 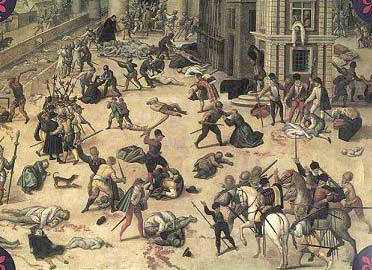 In what became known as the St. Bartholomew's Day Massacre of 24 August – 17 September 1572, Catholics killed thousands of Huguenots in Paris. Similar massacres took place in other towns in the weeks following, with an estimated total death toll of 110,000. An amnesty granted in 1573 pardoned the perpetrators. King Henry IV It was Catherine de Medici who persuaded her weakling son Charles IX to order the mass murder, which lasted three days and spread to the countryside. On Sunday morning August 24th, 1572 she personally walked through the streets of Paris to inspect the carnage. Henry of Navarre's life was spared when he pretended to support the Roman Catholic faith. In 1593 he made his "perilous leap"and abjured his faith in July 1593, and 5 years later he was the undisputed monarch as King Henry IV (le bon Henri, the good Henry) of France. When the first rumors of the massacre reached the Vatican in Rome on 2 September 1572, Pope Gregory XIII was jubilant and wanted bonfires to be lit in Rome. He was persuaded to wait for the official communication. The very morning of the day that he received the confirmed news, the pope held a consistory and announced that "God had been pleased to be merciful". Then with all the cardinals he repaired to the Church of St. Mark for the Te Deum, and prayed and ordered prayers that the Most Christian King might rid and purge his entire kingdom (of France) of the Huguenot plague. On 8 September 1572 a procession of thanksgiving took place in Rome, and the pope, in a prayer after mass, thanked God for having "granted the Catholic people a glorious triumph over a perfidious race" (gloriosam de perfidis gentibus populo catholico loetitiam tribuisti). Gregory XIII engaged Vasari to paint scenes in one of the Vatican apartments of the triumph of the Most Christian King over the Huguenots. He had a medal struck representing an exterminating angel smiting the Huguenots with his sword, the inscription reading: Hugonottorium strages (Huguenot conspirators). In France itself, the French magistracy ordered the admiral to be burned in effigy and prayers and processions of thanksgiving on each recurring 24th August, out of gratitude to God for the victory over the Huguenots. The fifth holy war against the Huguenots began on February 23, 1574. The conflict continued periodically until 1598, when Henry of Navarre, having converted to Catholicism and become King of France as Henry IV, issued the Edict of Nantes. The Edict granted the Protestants equality with Catholics under the throne and a degree of religious and political freedom within their domains. The Edict simultaneously protected Catholic interests by discouraging the founding of new Protestant churches in the Catholic-controlled regions. The Huguenots were allowed to practice their faith in 20 specified French "free" cities. France became united and a decade of peace followed. After Henry IV was murdered in 1610, however, the persecution of the "dissenters" resumed in all earnestness under the guidance of Cardinal Richelieu, whose favorite project was the extermination of the Huguenots. With the proclamation of the Edict of Nantes, and the subsequent protection of Huguenot rights, pressures to leave France abated, as did further attempts at colonization. King Louis XIV However, Louis XIV (the Sun King, 1643-1715) began to apply his motto l'état c'est moi ("I am the state") and introduced the infamous Dragonnades - the billeting of dragoons in Huguenot households. He began with a policy of une foi, un loi, un roi (one faith, one law, one king) and revoked the Edict of Nantes on 22 October 1685. The large scale persecution of the Huguenots resumed. Huge numbers of Huguenots (with estimates ranging from 200,000 to 500,000) fled to surrounding Protestant countries: England, the Netherlands, Switzerland, Norway, Denmark and Prussia — whose Calvinist Great Elector Frederick William welcomed them to help rebuild his war-ravaged and under-populated country. Protestant churches and the houses of "obstinates" were burned and destroyed, and their bibles and hymn books burned. Emigration was declared illegal. Many Huguenots were burned at the stake. Many Huguenots who did not find their death in local prisons or execution on the wheel of torture, were shipped to sea to serve their sentences as galley slaves, either on French galley ships, or sold to Turkey as galley slaves. The first Huguenots to leave France seeking freedom from prosecution had done so years earlier under the leadership of Jean Ribault in 1562. The group ended up establishing the small colony of Fort Caroline in 1564, on the banks of the St. Johns River, in what is today Jacksonville, Florida. The colony was the first attempt at any permanent European settlement in the present-day United States, but the group survived only a short time. In September 1565, an attack against the new Spanish colony at St. Augustine backfired, and the Spanish wiped out the Fort Caroline garrison. On December 31, 1687 a band of Huguenots set sail from France to the colony at the Cape of Good Hope, South Africa. Individual Huguenots settled at the Cape of Good Hope from as early as 1671 and an organized, large scale emigration of Huguenots to the Cape of Good Hope took place during 1688 and 1689. A notable example of this is the emigration of Huguenots from La Motte d'Aigues in La Provence, France. Many of these settlers chose as their home an area called Franschhoek, Dutch for French Corner, in the present day Western Cape province of South Africa. A large monument to commemorate the arrival of the Huguenots in South Africa was inaugurated on 7 April 1948 at Franschhoek. Many of the farms in the Western Cape province in South Africa still bear French names and there are many families, today mostly Afrikaans speaking, whose surnames bear witness to their French Huguenot ancestry. Examples of these are: Blignaut, Hugo, Joubert, du Toit, de Villiers, Viljoen, Theron, du Plessis, Malan, le Roux and Labuschagne amongst others, which are all common surnames in present day South Africa. Barred from settling in New France, many Huguenots moved instead to the Dutch colony New Netherland later incorporated into New York and New Jersey and the 13 colonies of Great Britain in North America, the first in 1624. Huguenot immigrants founded New Paltz, New York, where is now located the oldest street in America with the original stone houses, New Rochelle, New York (named after La Rochelle in France). Chretien du Bois was one of the original Huguenot settlers in this area. Some of the settlers chose the Virginia Colony, and formed communities in present-day Chesterfield County and Powhatan County just west of Richmond, Virginia, where their descendants continue to reside. The Huguenot Memorial Bridge across the James River was named in their honor, as were many local features including several schools. Many Huguenots also settled in the area around the current site of Charleston, South Carolina. In 1685, Rev. Elie Prioleau from the town of Pons in France settled in what was then called Charlestown. He became pastor of the first Huguenot church in North America in that city. The French Protestant (Huguenot) Church of Charleston, which remains independent, is the oldest continuously active Huguenot congregation in the United States today. Most of the Huguenot congregations in North America merged or affiliated with other Protestant denominations, such the Presbyterian Church (USA), United Church of Christ, Reformed Churches, and the Reformed Baptists. An estimated 50,000 Huguenots fled to Britain. A leading Huguenot theologian and writer who led the exiled community in London, André Lortie (or Andrew Lortie), became known for articulating Huguenot criticism of the Holy See and transubstantiation. Of these refugees, upon landing on the Kent coast, many gravitated towards Canterbury, then the county's hub, where many Huguenot families were granted asylum. Edward VI granted them the whole of the crypt of Canterbury Cathedral for worship. This privilege later shrank to the former chantry chapel of the Black Prince, where there is still a Huguenot chapel. Access can now be gained to this chapel by those whose names are derived from any of the French names featured on a poster on the chapel's outer door, and it is also open to the general public on the annual cathedral open-evening in October. Other evidence of the Huguenots in Canterbury includes 'the Weavers', a half-timbered house deriving its name from their chief occupation, and they also settled elsewhere in Kent, particularly Tenterden. Huguenot refugees flocked to Shoreditch, London in large numbers. They established a major weaving industry in and around Spitalfields (see Petticoat Lane and the Tenterground), and in Wandsworth. The Old Truman Brewery, then known as the Black Eagle Brewery, appeared in 1724. The fleeing of Huguenot refugees from Tours, France had virtually wiped out the great silk mills they had built. Many Huguenots settled in Ireland during the Plantations of Ireland. Some of them fought against the troops of Louis XIV in the Williamite war in Ireland, for which they were rewarded with land grants and titles. Some of them took their skills to Ulster and assisted in the founding of the Irish linen industry. Huguenots refugees found a safe haven in the Lutheran and Reformed countries in Germany and Scandinavia. Nearly 44,000 Huguenots established in Germany. Several congregations were founded, such as the Fredericia (Danmark), Stokholm, Frankfurk, Emden, Middleburg. The exodus of Huguenots from France created a kind of brain drain from which the kingdom would not fully recover for years. The French crown's refusal to allow Protestants to settle in New France was a factor behind that colony's slow population growth, which ultimately led to its conquest by the British. By the time of the French and Indian War, there may have been more people of French ancestry living in Britain's American colonies than there were in New France. Frederick the Great of Prussia, a strong believer in religious tolerance, invited Huguenots to settle in his realms, and a number of their descendants rose to positions of prominence in Prussia. The last Prime Minister of the (East) German Democratic Republic, Lothar de Maizière, was a scion of a Huguenot family. 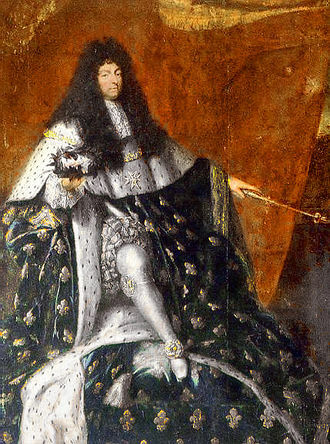 The persecution and flight of the Huguenots greatly damaged the reputation of Louis XIV abroad, particularly in England; the two kingdoms, which had enjoyed peaceful relations prior to 1685, became bitter enemies and fought against each other in a series of wars from 1689 onward. Persecution of Protestants ended in 1764, and the French Revolution of 1789 finally made them full-fledged citizens. Protestants in France today number about 1 million, or about 2% of the population. They are most concentrated in the Cévennes region in the south. A third of American Presidents have some proven Huguenot ancestry, as do Alexander Hamilton, John Jay, and other leading statesmen, and (according to an oft-repeated belief) one quarter or more of all Englishmen. Huguenot refugees in Prussia are thought to have contributed significantly to the development of the textile industry in that state. In 1924 a commemorative half dollar, known as the Huguenot-Walloon Half Dollar, was coined in the United States to celebrate the 300th anniversary of their initial settlement in what is now the United States. One Huguenot colonist was a silversmith named Apollos Rivoire, who would later anglicize his name to Paul Revere. He would, still later, give his name and his profession to his son, Paul Revere, the famous United States revolutionary. A neighborhood in New York City's borough of Staten Island is named Huguenot, and the nearby town of New Rochelle is named after La Rochelle, a former Huguenot stronghold in France. Nicholas Martiau “Captain Nick” was born in Il de Rhe France 1591. The Martiaus were French Walloon Huguenots residing in the Valley of the Meuse, Belgium Walloon refers, in daily speech to French-speaking Belgians from Wallonia, “the land of the valleys.” When the Religious War, known as the Thirty years War commenced in 1619, fifty-five families, including the Martiaus, fled for their lives and took refuge in Holland. In the spring of the year 1620, some months before the Mayflower sailed for America, Nicholas Martiau, of a family of French Protestants sailed from England for America in the vessel, the Francis Bona Venture. Martiau acquired and settled upon a tract of land along the York River in Virginia. Nicholas Martiau was in the service of Henry Hastings, Earl of Huntington and member of the Virginia Company, and educated as a military engineer. He was naturalized as an Englishman by royal decree. He came to Jamestown in 1620, legally representing the Earl to plan fortifications. After the 1622 massacre at Jamestown, the depredations of the Indians had caused such concern among the first settlers that a series of forts and outposts were planned, and the first "western" frontier was established by a line crossing the Tidewater Peninsula from Jamestown to the Charles (York) river along which it was proposed to erect a wall of logs. The construction of this log palisade and the protective forts was entrusted to Martiau, and the site on the Charles selected of a fort was called York. Martiau's defense of the French king in an argument with Capt. Thomas Mayhew forced him to take a loyalty oath in Jamestown in 1627. The fort at York occupied a point on the river at the mouth of the Wormley Creek, named for the first settler in that section, Colonel Christopher Wormley, and lies about two miles down the river from the present site of Yorktown. The safety of the fort caused a settlement to spring up around it, and in 1633 York was selected as a receiving port. A store was built for receiving and shipping purposes, and to serve the inhabitants both of York and the settlement at Kiskiack. So sturdily did Martiau build York for that it was still in active use more than forty years later when it was described as "the most considerablest fortress in the country." During the Indian uprisings along the Rappahannock in 1676 the terror-stricken county folk of Gloucester fled across the river for refuge in the fort at York. They were dismayed to find that they could be afforded scant protection there, however, for to prevent the fort's stores of arms and ammunition falling into the hands of Nathaniael Bacon, who was also on the warpath, Governor Berkeley had taken them with him in his flight to the Eastern shore. Having engaged so actively in the defense against the Indians, it is reasonable to assume that Captain Martiau was eager to begin reaping some of the benefits to be derived from his own defensive works. He was also active in the legislative affairs of the Colony, as Representative in the House of Burgess from both Kiskiack and the Isle of Kent in the Chesapeake, and he probably had a hand in framing the Court Order of October 8, 1630. Captain Martiau was among the first settlers to qualify for land under this Act, following Captain Robert Felgate, John Utie, and John West into the wilderness of Kiskiack. For "Adventure of himselfe, his wife and ten persons to Chiskiake...and for the transportation at his own costs and charges of fourteene persons into this Colony," Governor Francis Wyatt granted Martiau patent to sixteen hundred acres on May 20, 1635, to be "augmented and doubled when he or his assigns shall have sufficiently peopled and planted the same." This land included the present site of Yorktown and lay between the holdings of Sir John Harvey who held patent to the land from directly east of Martiau to York at the mouth of Wormley Creek and the estate of Richard Townsend west of what is now Yorktown Creek. Because of the tyrannical rule of neighbor Sir John Harvey during his term as Governor, Martiau strongly opposed him. Opposition, while general throughout the Colony, centered at York and Kiskiack, both being Burgess districts separately represented in the Jamestown Assembly. It was daring of Captain Nick but typical of the man's spirit of fearless independence. If the campaign against Harvey had proven unsuccessful there is no doubt that Martiau would have lost favor with his patron in England, the Earl of Huntington, and his fortunes in Virginia would have come to a very definite ending. But Martiau was again fortunate. Governor Harvey was finally arrested by the colonists themselves and sent back to England. Harvey returned, bringing George Reade--Martiau's future son-in-law with him. Martiau moved to the present Yorktown site in 1630 on 600 acres, plus 700 for headrights, where he grew tobacco. On this land Cornwallis surrendered his troops to Martiau's great-great-great-grandson, General George Washington in 1781. Martiau later was granted 2000 acres on the south side of the Potomac River, which he gave to Col. George Reade in 1657. The Harvey affair was one of the first manifestations of the strange new force of uncontrollable power at work in the minds of the first settlers. They tingled with unaccustomed impulses of freedom in this wild, new land; and for the first time, the united strength of the English yeomen seemed adequate to their imaginings. It was this unity of effort, while preserving the rights of the individual that furthered their every activity. In 1633 every fortieth man between the James and the York was directed to repair to the plantation of Dr. John Pott to be employed in building the houses of "Middle Plantation," that tiny budding settlement that was to blossom out into the City of Williamsburg and the Colonial Capital of Virginia. The men of York and Kiskiack can well be depended upon to have entered into the construction of Middle Plantation with the same energy and spirit with which they greeted each new enterprise. The Legislature had divided Virginia into eight shires or counties in 1634, and Kiskiack and York had been included in Charles County which extended from beyond the Charles River to the center of the peninsula where it met James City County which, in its turn, included the land south to beyond the James River. Middle Plantation lay along the boundary dividing these two counties. In 1642 the name for both the river and county of Charles was changed to York, in honor of the Duke of York who became James II, and the future site of Williamsburg founded itself half in York county. The records of James City County were destroyed during the Civil War, but those of York County were preserved; and through their preservation, invaluable documentary research material for reference in the John D. Rockefeller restoration of the City of Williamsburg was provided. In 1642 he married Jane Berkeley, widow of young Leftenant Edward Berkeley who had been killed in the Indian massacre of 1622. She arrived on the Seaflower in 1621. Berkeley, a man of great industry, established the first iron works in America and would, no doubt, have made a real name for himself had not the Indians cut him down along with all of his iron-workers in a surprise attack. In marrying Jane, Martiau established himself and his family as the first ancestors in America of another eminent military engineer, George Washington. Good-wife Jane had a daughter, Jane, whom Martiau raised as one of his own. After the death of Jane, Nicholas married Isabella widow of Robert Felgete and George Beech, in 1646. Martiau was the most important of all the many Huguenots who increased in the early population of the Colony, most of whom had been imported in order that the English settlers might "benefit by the frenchmen's skill and instructinge of others in the Arte of plantinge and settinge of Vines and in the ministry of making Wyne." Captain Nick scorned such puerile pursuits. He led expeditions against the Indians, continued to study and improve the colony's fortifications, brought many new immigrants to Virginia at his own expense, became a successful planter, was ever an active vigilant protector of the people's rights in his legislative capacity in the Assembly and became the First Citizen of the land that alter was chosen for the site of Yorktown. Besides his stepdaughter, Jane, Martiau had four children of his own. His son, Nicholas Jr., died before reaching maturity. One daughter, Sarah, married Captain William Fuller, the Governor of Maryland. Another daughter, Mary, married Colonel John Scarsbrook, a leader in the Bacon Rebellion. The third daughter, Elizabeth, married Colonel George Reade who in 1637 was Secretary of the Colony and in 1638 was acting Governor. It is through Elizabeth and George Reade that Washington traces his ancestry to Martiau, for the Read daughter, Mildred, married Augustine Warner II; the Warner's daughter, Mildred, married Lawrence Washington; the Washington's son, Augustine, married Marry Ball who was the mother of George Washington. Captain Nicholas Martiau thus became the great-great-great-grandfather of the First President. Capt. 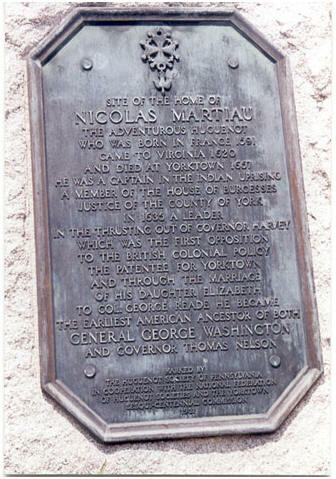 Nicholas Martiau died 1657 in York County, Virginia. In the name of God Amen. I Nicholas Martiau, of the County and Parish of York gent. being very sick and weak in body but sound and perfect memorie blessed be god Doe make ordained constitute and appoint my last Will & Testiment in manner and forme followeing Revoaking annulling & disclaiming all & all manner of former & other Will or Wills written or noncupative all codicils legacyes & bequeths whatsoever by me att any time before the ensealing of this my last will made signed & sealed or otherwise by word of mouth or made & delivered; And appoint this only t stand & be my last Will and Testament, as followeth: ffirst I bequeth my Soule unto the hand of God my maker hopeing & assuredly believing that when this life shall end I shall through the merits of Jesuus Christ my Redeemer to injoy everlasting Rest and happiness. Andy my body to the Earth from whence it came to be decently buried. Item for that Estate which almighty God hath been pleased to lend me in this world I hereby bequeth & dispose thereof in manner and forme following: Item I give and bequeth to my Eldest Daughter Elizabeth wife of George Read Esq & the heires of her body begotten or to be begotten foever all that my Divydent of land scituate lying and being in the sd. Parish and county of York (Except as hereunder excepted) with all houses and appurtenances. Item I give and bequeth to my daughter, Mary Scarsbrook, wife of John Scarsbrook soe much of my sd. Divydent of Land in York Parrish as is scituate and lying beyond the Swamp (vitz) on the Southward side of the Swamp called commonly Broccas Swamp upon part of which the said John is now seated to be held by the sd. Mary and her heirs lawfully begotten & to be begotten forever with appurtenances. Item I give and bequeth to my Daughter Elizabeth Read & her heries forever my old mare wth. her whole increase male and female to her and her heires Except the first mare foal shee shall being after my decease which I hereby give & bequeth wth. the whoole increase thereof to my Daughter Sarah of Capt. ffuler & her heires forever. Item I give and bequeth to my loving Daughter Mary Scarsbrook & her heires forever the mare ffoale now runeing wht. my mare wth. whole Increase male and female. Item I give and bequeth to my loveing Daughter Elizabeth Read my Watch. Item I give to my said Daughter Elizabeth Read her heires my Grey Gelding but my sonn John Scarsbrook to make use of him for his occasions. Two years after my decease when he shall desyre the same. Item I give and bequeth to my Daughter Sarah ffuler wife of Capt. William Ffuller above named and for her heires forever all that my Divydent of land lying in Potomack and contying two Thousand Acres But in case itt shall not be seated by some of them (vitz) Capt. ffuler or his said wife or heires att elast one month before expiration of time limitted by the Pattent for seating then the same to be made Sale of Executrix as hereunder named & the produce thereof to be equally dyvyded betweene my said three loveing Daughters for the good of them and their children. Item My Will is that within one yeare after my decease all cattle now in my posession marked wth. my Daughter ffulers mark shall be delivered for the good of her and her children & I doe also give and bequeth to her and her heires forever Tenn cowes more out of my Stock or to be gought out of my Estate with their whole increase male and female and also a bull to be delivered within a yeare as above said. Item I give to my loveing sonn, George Read, Esq. all my weareing apparel except my stuff suite and coate and new Dimity caster which I hereby bequeth to my Sonn John Scarsbrook and alsoe will that ffive pounds ready money now lying by me to be equally divyded between my said Two son in lawes. Item my will that at finishing the next crop after my Debts are satisfied my Two Negroes Phill & Nicholas shall be free and that each of them have them delivered by my Executxes, one Cow and Three Barrells of Corne, cloathes, & also nayles to build them a house but they or either of them shall hire themselves after their said ffredom or before or shall remove from the land hereunder appointed them then they or he soe doeing to returne to my executrixes for the food of them and their Children And my Will is that they have land sufficient for themselves to plant in the ffeild where William Leigh lived for their lives of the life of the longer Liver of them. Item I give and bequeth to my above named Two loveing Daughters Elizabeth Read and Mary Scarsbrook for the good of themselves & their Children All the rest of my Estate whatsoever in Virginia or elsewhere to be equally divided betweene them but this divysyon not to be made untill all my Debts & Legacyes be satisfied which said secerall Debts are to be paid out of the part of my Estate as is given to my said Two daughters & their Children without any Charges to my Daughter Sarah or her heires. Item lastly I doe by these presents, nominated & appointed & confirmed my two beloved Daughters Elizabeth and Mary joynt Executrixes of this my last Will & Testament & of every matter course & thing therein conteyned I have hereto sett my hand and Seale this first day of March One Thousand Six hundred and fifty Six. Nicholas Martiau.